Apparently I’m a sucker for boat tours. We’ve gone on a dinner cruise through Alaskan waters, a narrated Star Ferry tour in Victoria Harbour, an airboat ride through the Everglades, a tour of the San Francisco Bay, bamboo rafts in a couple of places in Guangxi, and a glass-bottom boat off of Catalina Island, just to name the ones that are springing to mind. 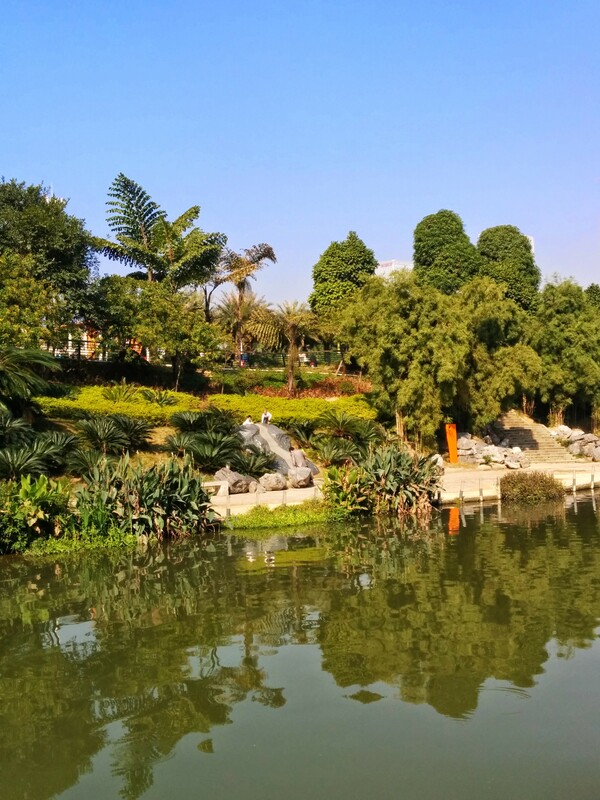 Ever since 南宁 Nanning constructed 民歌公园 Minge Park (Folk Song Park), I’ve been itching to add a 民歌湖 Minge Hu (Folk Song Lake) boat tour to the list. Family came to visit, and we planned to visit Nanning with them for touristy fun. It was time to finally seize the jihui. The boat tour dock is relatively easy to find. 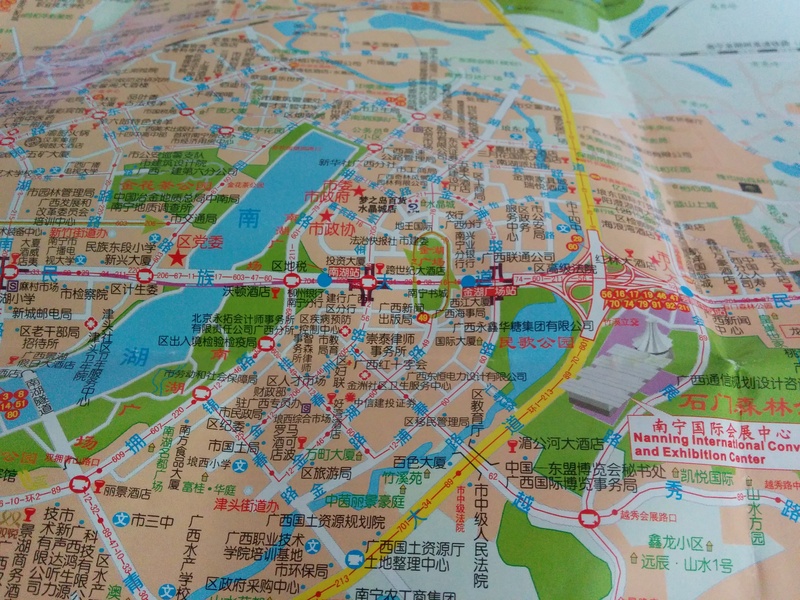 It’s located at the southern end of the 酒吧街 “bar street” at Minge Park. There’s a sign in Chinese, but even if you can’t read it, it’s pretty obvious because, well, there’s a bunch of boats moored to the dock. We approached the ticket office and started to read the posted times for boat tours. The fuwuyuan quickly informed us that since they weren’t busy, we could leave any time we were ready. It would be 50 kuai/person for a tour that would take us north of Minge Hu and back, or 100 kuai/person to go from Minge Hu over to Nanhu (South Lake). We opted for the round-trip, and bought our tickets. Pagoda roof of the boat, with the White Lotus Building in the background. And a Starbucks cup in the foreground. When we returned, the captain and fuwuyuan were waiting for us. She was apparently also the tour guide/deck hand for our excursion. We had our choice of three different types of boats. I absolutely wanted to ride the gudai boat with the yellow pagoda roof. The cheesiness was part of its charm. We boarded the boat, and we were off. Interior of the boat. Captain on the starboard side, tour guide (or whatever she was) on the port. An audio recording of interesting facts about the lake and its surroundings was playing inside the cabin, mixed with Chinese instrumental music. So maybe our real-life tour guide wasn’t going to do much guiding. She did inform us that we could step out onto the viewing platform on the stern to take pictures and enjoy the passing scenery. 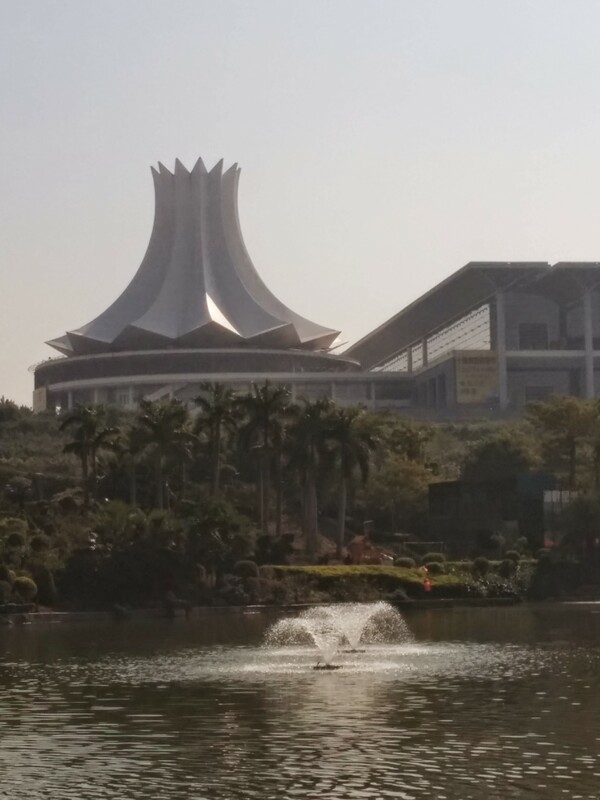 There were some nice views of the Nanning International Convention and Exhibition Center. (That’s quite a mouthful, so it’s affectionately known in our family as the “White Lotus.” I can’t remember anymore if someone told us it’s supposed to look like a white lotus flower, or if we just made that up.) 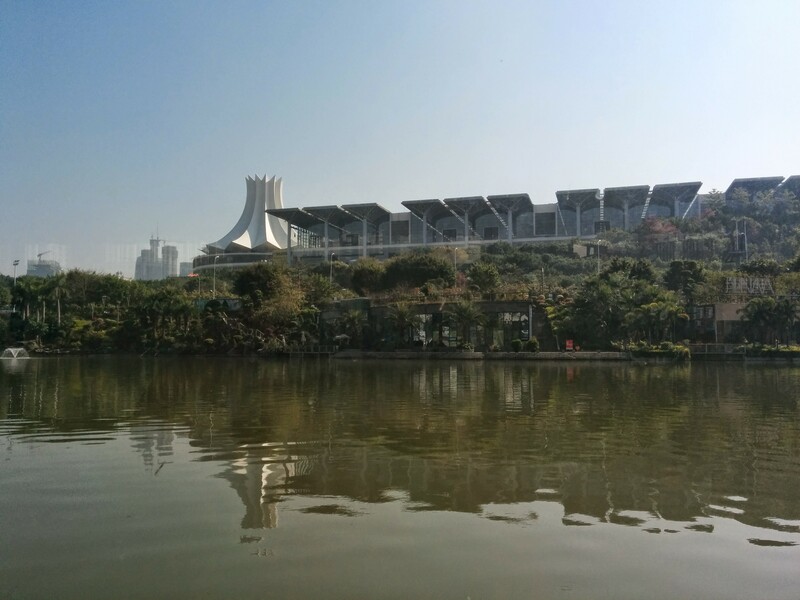 This is where Nanning’s pride, the China-ASEAN Expo is held every year. 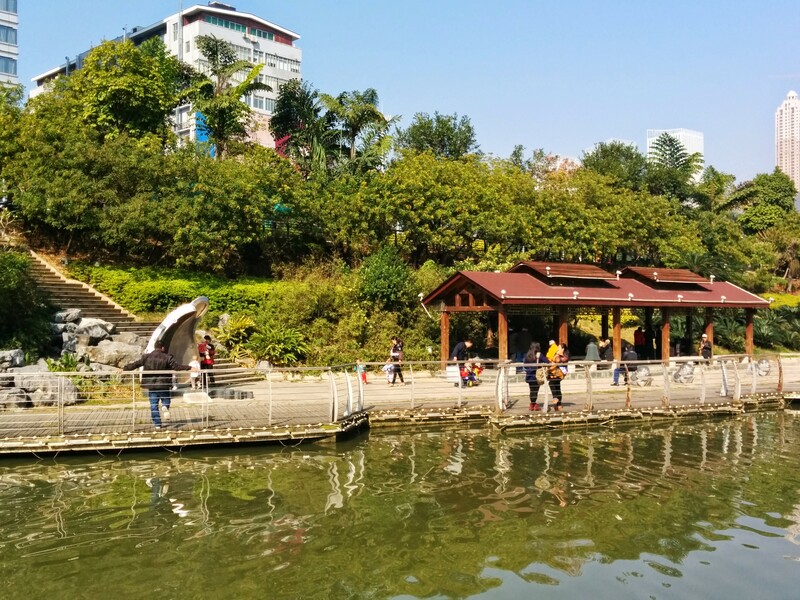 Walking paths, landscaping, art and other features have been installed all along the river north of Minge Hu. Our guide said the area is even prettier at night when it’s lit up along the paths. Wow, this is incredibly different than the nasty sludge of a river I remember running through this area years ago. Nanning cleans up nice. There were murals and other artwork underneath every bridge. Most featured scenes from relatively recent (read “since 1949”) Chinese history. 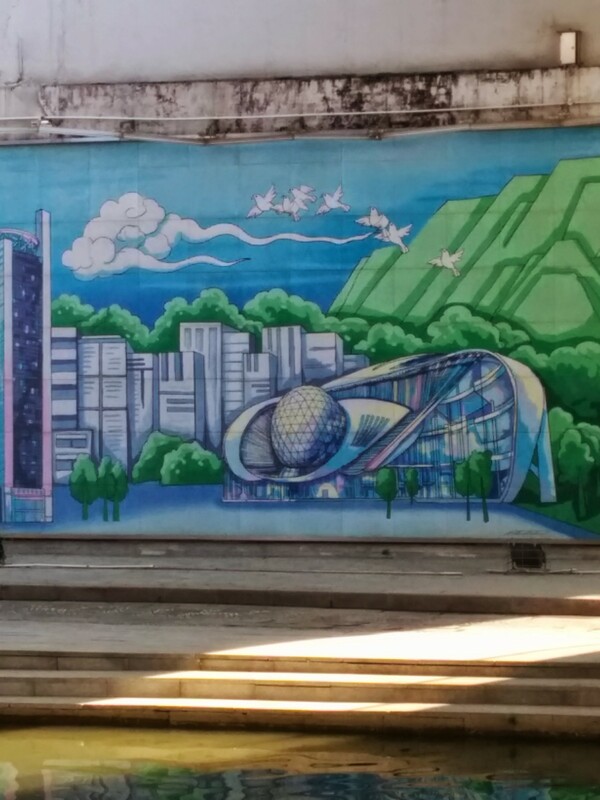 There were also some paintings of famous Nanning landmarks. 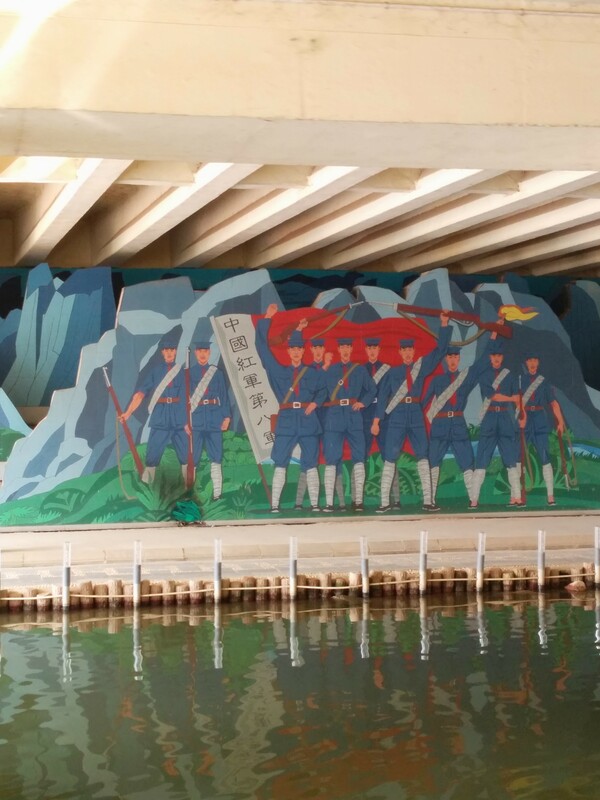 Below are scenes commemorating the Longzhou Uprising, and depicting the Guangxi Science Museum. Hmmm…that’s an awful lot of gunk and grime for being just a few years old. 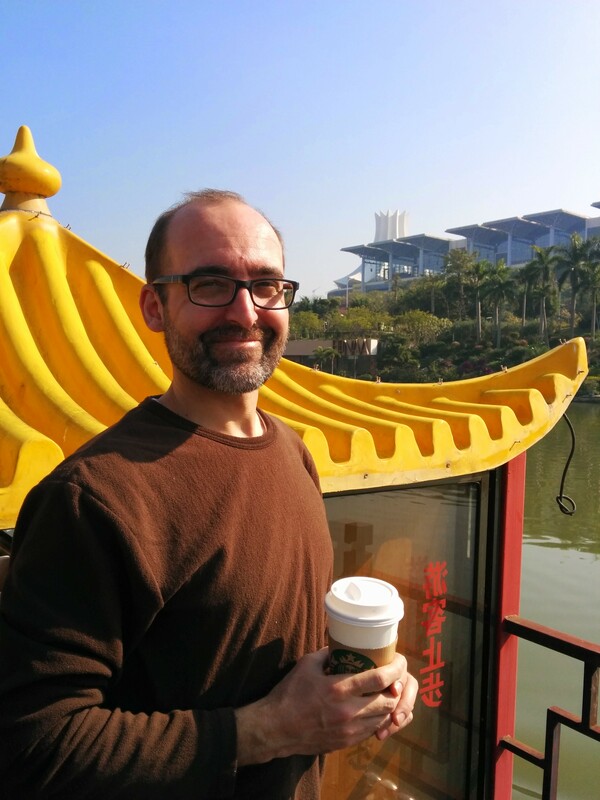 Nanning may clean up nice, but doesn’t necessarily stay nice. We saw some locals using the river as they have forever – for washing laundry and for fishing. Um, laundry AND fishing, huh? Cool. Reminds me why I don’t eat locally caught fish. My kids were super-excited to let me know that there was a BATHROOM on the boat (door on the left of the photo below). They informed me that one’s business would go directly into the lake. I didn’t check on this fact, but that would be yet another strike against eating fish from this river. I was really surprised when we came upon this waterfront shopping area. I never knew it existed. Our real-life tour guide explained, “They just finished building this, and it won’t open for a few more weeks.” It looks like it will be a fun area. Or it could be a complete and utter bust. You never know in China. Views alternated between “I’m in the middle of a city” and “I can’t possibly be in the middle of a city.” Okay, I guess there were always buildings in the background to ruin the latter illusion, but it was still quite peaceful for much of the journey. It was nice to take pictures on the deck, but it was also nice to just sit inside and enjoy the ride. Sittin’ and sippin’ our coffee and hot cocoa. Mmmmmmm….overpriced hot beverages, how I’ve missed you. We returned to the dock and the tour was over. 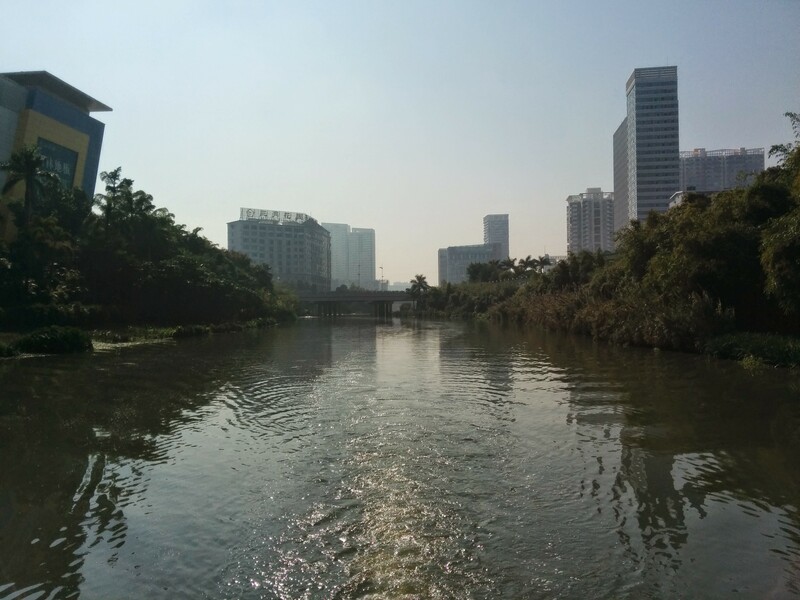 All in all, it was a very nice little trip, giving us an interesting view of Nanning that we don’t normally get to see. I was glad to have finally gone on this boat tour. 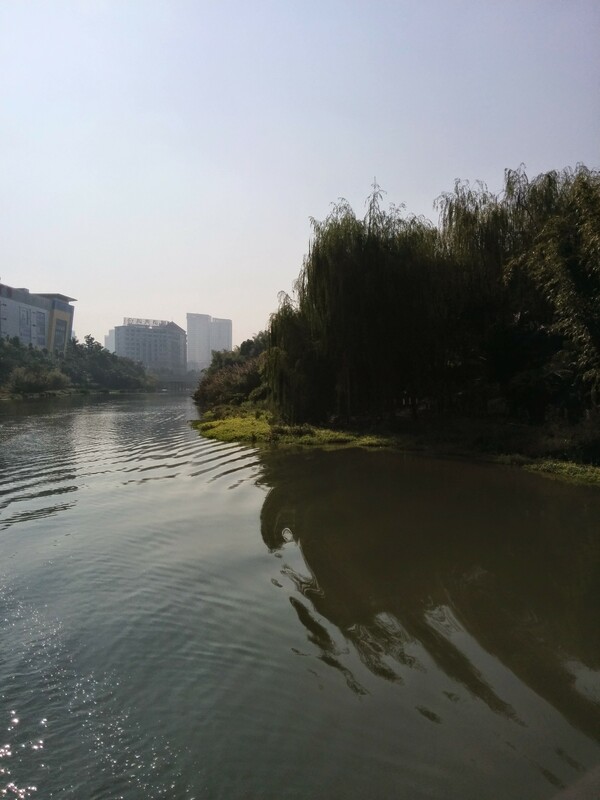 Nanning is supposedly trying to change its nickname from “Green City” (as in ‘lots of green plants,’ not necessarily ‘ecologically friendly’) to “Water City,” and there are rumors of more lake and river improvements to come. 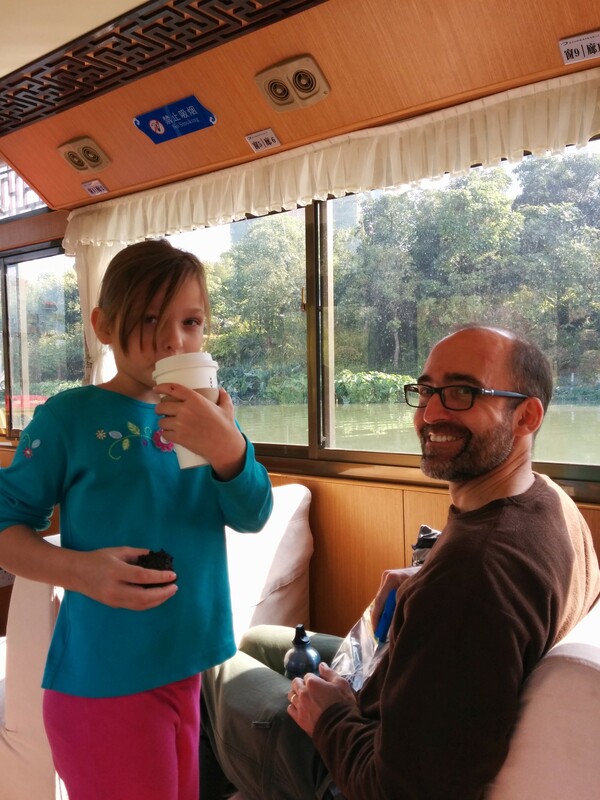 Maybe I’ll soon have a few more boat tours to add to my list. Nice trip, it is fascinating how your perception of a place can change when view it from a different angle, such as through a boat trip, which is why I highly recommend it to anyone who is interested.